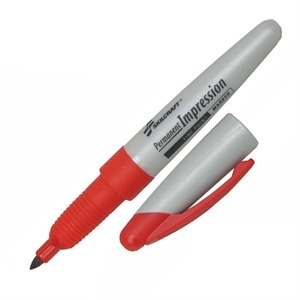 Permanent Impression Markers are perfect for writing, drawing or lettering on almost any surface including plastic, glass, metal, rubber, wood and much more. Durable fine tip allows extended use and delivers bold lines. Ink is both fade-resistant, water-resistant and will not smear. Stylish barrel features a rubber grip for writing comfort. Cap comes with a pocket clip to attach marker to pockets, notebooks and more. Markers conform to ASTM D4236.